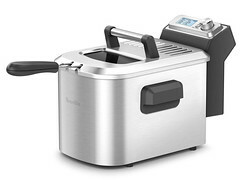 Your Breville Smart Fryer™ is an electronic deep fryer that adjusts time and temperature to suit what you’re cooking. Try the Twice Fried function for restaurant-style fries. A. 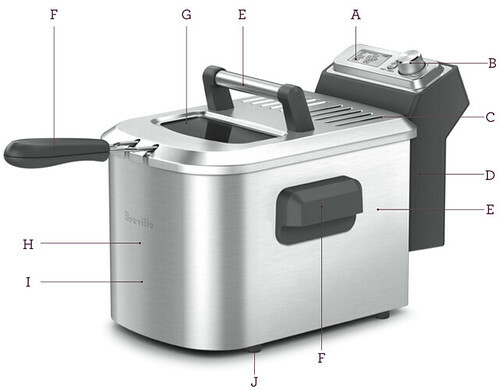 - LCD display - Indicates time, temperature plus preprogrammed cooking functions. C. - Mesh filter - Minimizes cooking odors. E. - 'Cool Zone' technology - Debris falls into cooler oil, preventing excess burning and extending oil life. F. - Cool touch handles. G. - Large viewing window. H. - Large 4-quart capacity. I. - Stainless steel exterior. 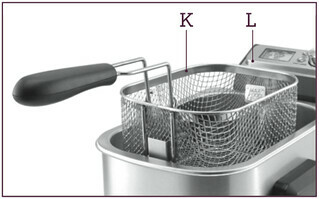 K. - (pictured below)Frying basket with fold-down handle. L. - (pictured below)Powerful 1800 watt removable element.